I never saw the appeal of those figures. They looks so bland and boring. I prefer stuff like the Sideshow collectible Bond figurines. It would be cool if they came out with a new set of action figures. better question, and more mass appeal; why no Hallmark Christmas ornament? Press the button on the DB5 and hear the theme? Or a Connery? Seems rather obvious. I've always thought the absence of a LEGO Bond set or console game was a missed opportunity. Not necessarily LEGO who don't want it to happen, though. It takes an agreement between them and the owners of the Bond franchise; you don't know which one of them is saying no. A Lego 00 game would be AMAZING. They're having tremendous success with Batman, surely they could with Bond! I would rather see a company like Hot Toys produce 1/6 Bond figures. It's been about a decade since the Sideshow figures. Something to do with mature themes, I think; LEGO still wants to be seen as, if nothing else, a brand that appeals to all ages. Granted themes like Star Wars and Lord of the Rings have their fair share of violence, but the origin of those two properties (whether or not it's recognizable now) was "For Kids", or "For All Ages". Bond's origins are with Fleming's early literary works which of course are rife with sexism, racism, violence, etc. I'd like to see Diamond Select Toys make a line of James Bond action figures. I have their set of 6 inch Star Trek original series action figures and they are fantastic. While I don't own it, their Dr. Who line is also pretty good having a figure of Every doctor in one huge box set. I'd love to see them take a crack at Bond. That'd be pretty cool, maybe a Pop! Rides figure of each Bond and their signature car, like Connery and the DB5, Moore and the Esprit, and so on. 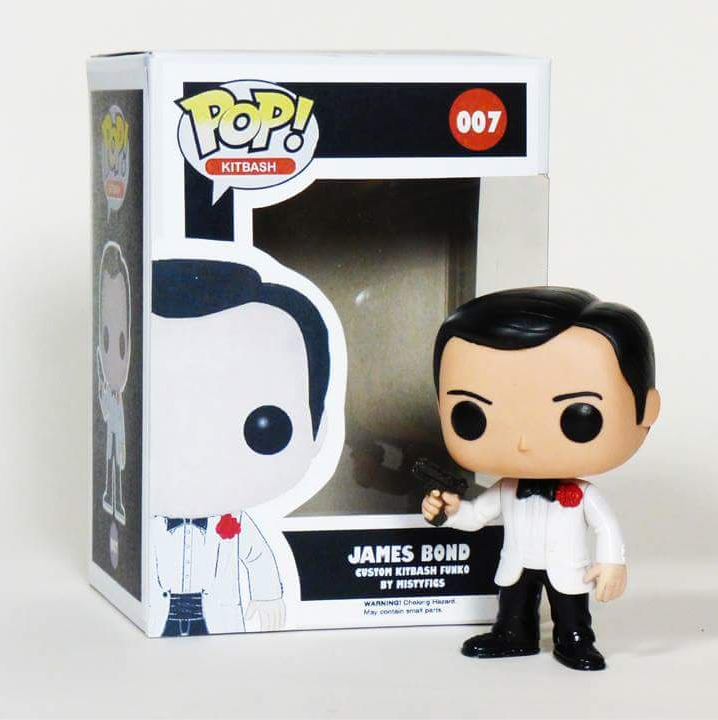 Bond merchandise in general is a real weak link in the franchise. They at least had games for a while but not anymore. I would love a POP figure or a better selection of shirts/hats/toys. There's plenty of Bond merchandise about...it's just aimed at an older crowd. Watches, cars, clothing, books, booze etc. Yeah it even says custom kitbash on the box. Great effort though. I'd buy it. I'd love it if Diamond Select/Art Asylum would do a line of Bond figures similar to their Star Trek figures. Alright everyone... I've got a project in mind. But I need YOUR help!! 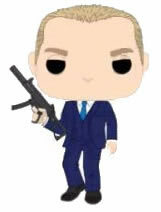 I'm going to customize a series of Bond Funko figs. I'm going to make one perfect tuxedo body (similar to the photo above but with a black jacket) and I'm going to modify the neck so that the head is interchangeable, and I will make EACH Bond actor! I have a head in mind for Connery, with a slicked back hair style, and I will paint his eyebrows with one raised as he does, and I have another one in mind for Moore, and I'll paint hair light brown along with his trademark eyebrows. The key is, the portraits are caricatures, and I'll be damned if I can think of what to use for the other actors. The trouble with these Funko figs is they never have a mouth or nose... I could probably get away with painting on Dalton's cleft chin though. Can anyone help me figure out which heads to use? I can't really sculpt, but can paint. I think this will end up really cool if I could just get it off the ground. Same here. 1/6 figures, now they're different. It's baffling that the only figures we can get, are unlicenced. Me too. That would be amazing actually. I was talking about the lack of Bond Pop figures with the owner of my local comic book store yesterday. She only have a small store, but has Pop figures everywhere based on so many different TV and Movie properties. James Bond appears to be a major hole in the collection for a big property not yet included. I did a bit more research on this and it would appear in a Funko Q&A carried out last year on Twitter that they've been working on getting rights to James Bond "forever". I've also read that James Bond is the one property the CEO of Funko dreams of producing models for. Whatever your feelings are on the quality of these figures, more Bond merchandise is better than very little in my book. As a collector I would say that, but it can only help to build the brand and safeguard the future of the series. I do not understand the rational of the Bond licence holders in not allowing more companies to produce new James Bond products (or, what I fear is probably the case, not making it viable for companies to make new products). We almost got new action figures from Corgi when Casino Royale was released, but see what happened there. And yet, they decide to remain with a failing company to produce 'new' collectibles. Instead, we're stuck with Corgi producing the same old models, Hot Wheels producing smaller scale, lower quality models or larger scale, highly priced cars and Big Chief Studios, who have produced a few fantastic looking models that few regular collector's can justify buying. In addition to Funko Pops all of the major franchises are now releasing official colouring books. Having already released an official sticker book, I wonder if they will skip Funko Pops and move onto a colouring in book instead. In any case, I doubt we will get either. But it would be a nice surprise if they did release them. Yeah, some figurines would be cool! Here are a few I've made. God I hope this is true. I don't have Goldfinger's wealth to throw around to buy museum pieces from Big Chief Studios but I can certainly swing Funko Pop bobble heads. Bring it on. I've got a luke skywalker in his x wing Bobble head and it's great. Great detail on it. Those Funko figures look rubbish. Great news @ggl007. Thanks for sharing with us.